A single machine or an entire plant. Our experienced team, using the latest equipment, can disassemble it, move it, and set it up – on time and on budget. From small day jobs, to installing, maintaining, and moving entire plants. We have achieved and maintained an excellent reputation in the field of rigging and mechanical erection. Our years of experience have provided us with a pool of the finest talent and equipment available. 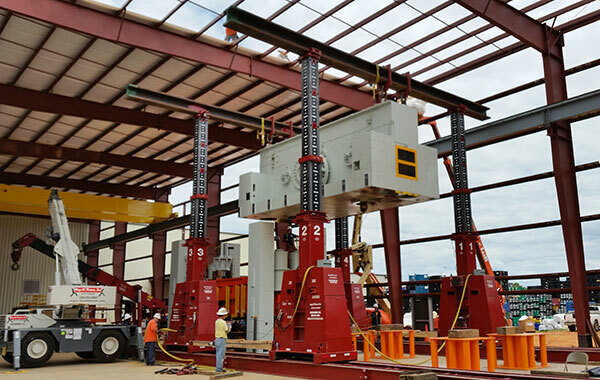 We own all of the equipment necessary to complete heavy and complex rigging projects—large forklifts, cranes, and heavy haul capability; specialized jacking and dolly systems; hydraulic gantry systems; and two 75-ton capacity machinery cranes. Our capabilities extend from building large metalworking and plastic injection presses to the installation of all types of machine tools. Because of our ability to optically align and level machinery, we can perform the turnkey installation of many types of production process equipment such as printing, corrugating, and furnace lines, as well as fiber optic cable lines. We are fully aware that scheduling and job performance are always mutually profitable. Because we own our equipment and have in-house electrical and mechanical capabilities, we are well qualified to meet difficult turnkey project requirements. Many of our superintendents and foremen have been with Guy M. Turner for 20 years or more. They know how to put our huge inventory of equipment to work to safely and successfully complete your project. Here’s a sample of the pool of equipment they can draw from—every piece of which we own. A typical project starts with a walk-through. We work individually with each client to determine needs for the specific project. We pre-plan every phase of the job, since every job is unique and has its different challenges and custom solutions. When our custom plan is approved, we assemble the best team for the job—drawing on our in-house electrical and mechanical experts—and get to work. While we work, so does your plant. Guy M. Turner tackles complex turnkey projects even in active plant and facility conditions, where safety and attention to nearby operations is crucial. Every rigging and millwright solution is custom-designed and clearly documented, with benchmarks for every phase of the job. We perform precision installation of all kinds of equipment. Our optical alignment capabilities ensure proper installation of production process machinery including printers, corrugators, furnace lines and fiber optic cable lines. Working two Mobil-lifts at once takes some careful choreography. It’s amazing what you can do when you get two Mobil-lifts working together. 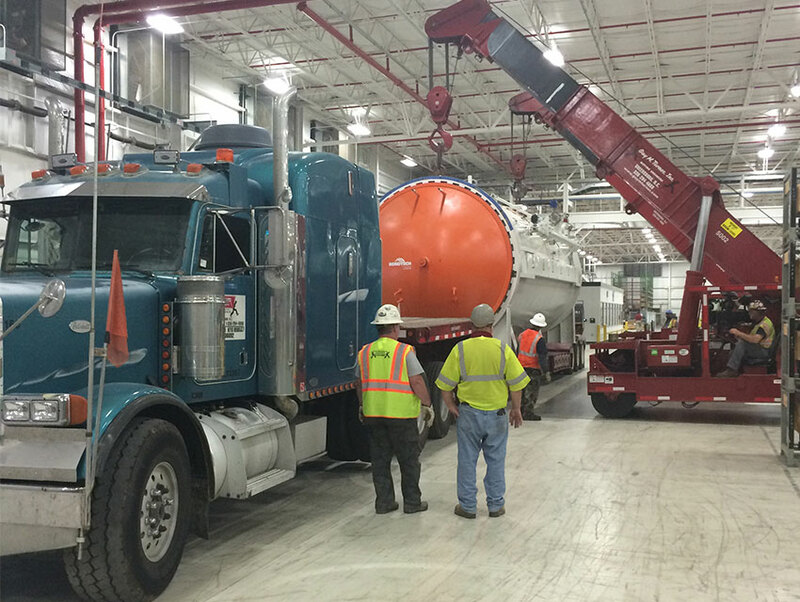 In this instance, we moved a 30-ton autoclave to the other side of a plant floor. Simple, right? Well, no. How we got this distillation tower and an entire Ketene to Mexico. It took experts in three different Guy M. Turner services. Our rigging team dismantled it. Our crane department lifted and placed it on the trailer. From there, our transportation division, Turner Transfer, hauled it to its destination in Mexico. A complete turn-key project. 5,000-ton titanium forging press installation. 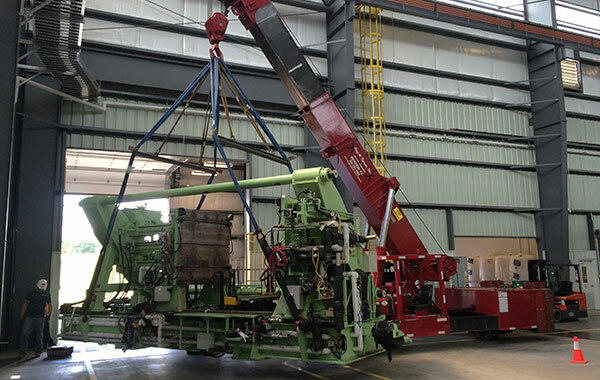 The installation of the 165-ton crown on this press required extensive calculations and simulations in our 3D Lift Plan software, which allowed us to precisely plan and execute the lift. The result? Perfect. 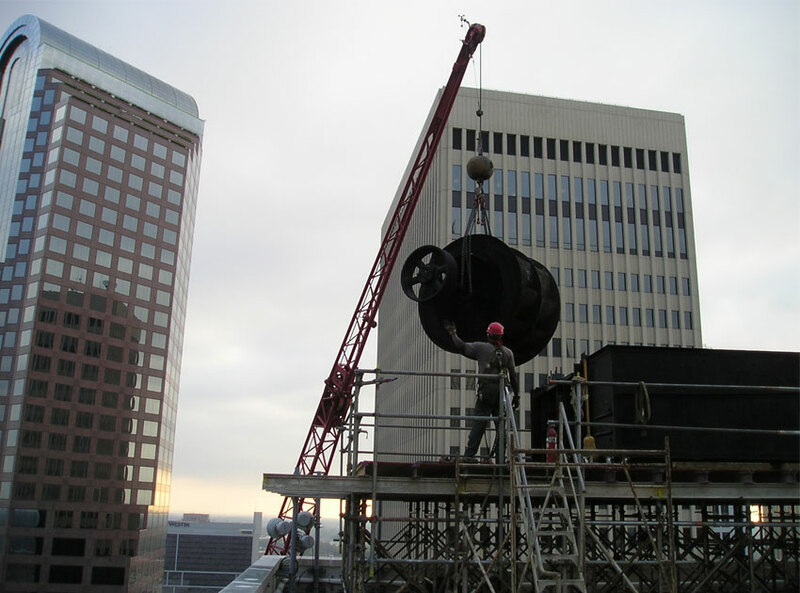 Here you see us using a 240-ton crane to put a center fan on top of a very tall bank building in Uptown Charlotte, NC. Constructing the scaffolding and getting the fan up that high put both our rigging and crane services teams to the test—a test they passed with flying colors. 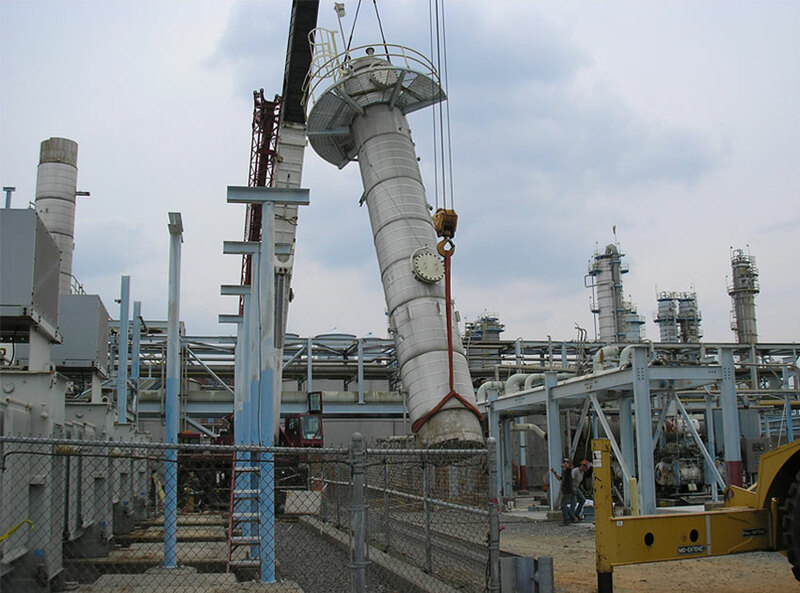 Removal of an existing & installation of a new corn dryer takes expertise and planning. 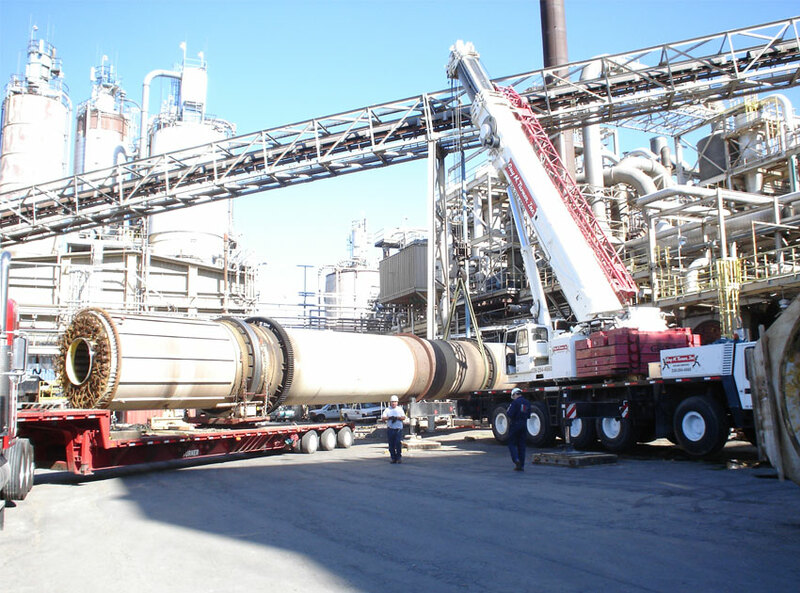 Our cranes and expert riggers removed an existing and installed a new corn dryer, as well as took care of all of the required specialized trucking to haul the dryer to and from the site. 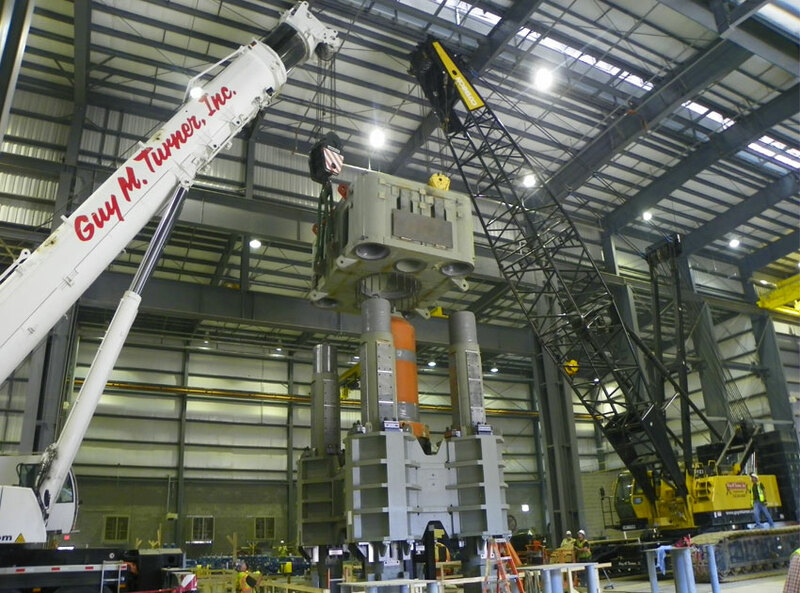 That’s why companies ask Guy M. Turner for help—they know we have cranes, rigging, and heavy/specialized trucking all under one roof – in order to get the job done right.